The most important legislative act that determined the future of Mission Bay was California’s Tidelands Act of 1868. Various bills were introduced, amended, debated and commented upon in editorials headed: “Tidelands Conspiracy,” “Behemoth Tidelands Bill,” “Tidelands Grab.” From this historical distance it is impossible to know what kind of secret alliances were formed to push through various bills. The homestead associations were suspected of being front organizations for the railroads. Whereas initially the railroads could do no wrong, the monopolistic practices of the Central Pacific set up a strong counter-reaction that reached a fever pitch in San Francisco and put Governor Haight in office in 1867. Here was a governor who at least spoke against such methods, even though his own actions proved to have less integrity than his stated convictions. The daily revelations of the press, combined with the truly astonishing land grabs proposed in the various tidelands bills introduced in the legislature, served to modify the final product. The railroads wound up with 150 acres, mostly in Mission Bay, or the equivalent of 345.5 fifty-vara lots. With the streets and three market places included, another 42 acres were added for a grand total of 192 acres or 442 fifty-vara lots. However, these streets and three squares that were set aside as market places “reserved for public use” were specifically withheld from the grant. The accompanying 1869 map gives a clear idea of the lands involved. Tidelands Auction Map, 1869. This portion of the official Board of Tideland Commissioners Map #3 shows some of the water lots to be auctioned in November 1869. The map is interesting because it shows a proposal to continue Channel Street’s canal to Seventh Street at a width of 140 feet, then to angle and narrow it to meet the mouth of Mission Creek at a width of 60 feet. The irregular line of salt marshes is the “Red Line of Mission Bay.” Inside the “Red Line” are water lots that were sold during the Peter Smith sales of 1853. The confusion over these various boundaries led to legal battles. The “Act to survey and dispose of certain salt marsh and tidelands belonging to the State of California” ordered the governor to appoint a Board of Tidelands Commissioners to “take possession of all the salt marsh and tidelands lying under water. . . belonging to the State of California. . . surveyed to a point not beyond twenty-four feet of water at the lowest stage of the tide. . . .” All such real property to be mapped and sold at public auction. Streets, docks and piers, canals and drains were reserved to the city of San Francisco. 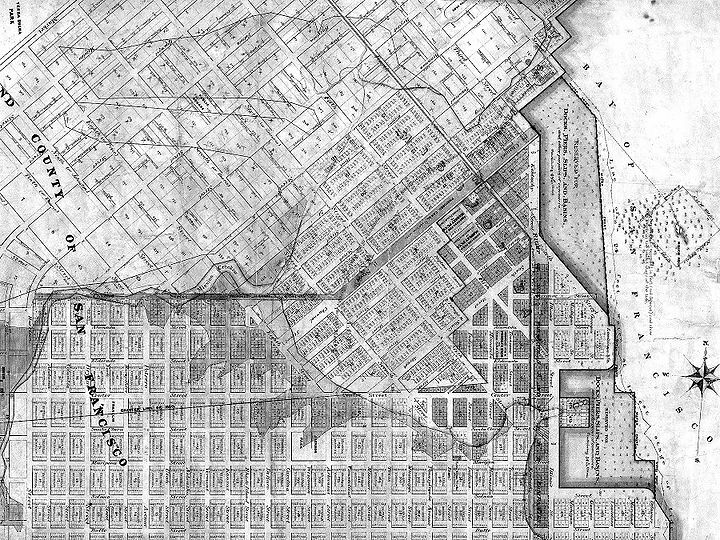 The Southern Pacific and Western Pacific railroads were granted 30 acres each, exclusive of streets, basins and public squares, on land south of Channel Street and outside the redline waterfront of Mission Bay.96 In addition the railroads were given a right-of-way not to exceed 200 feet in width. In return the railroads had to agree to spend $100,000 within thirty months to construct a San Francisco terminus. After the time was extended in 1872, the Mission Bay railroad terminus was completed. The Tideland Commissioners were to have the power to settle claimants’ disputes over water lots and to sell the tidelands as mapped and surveyed. All public monies were conveyed by the commissioners to the state. 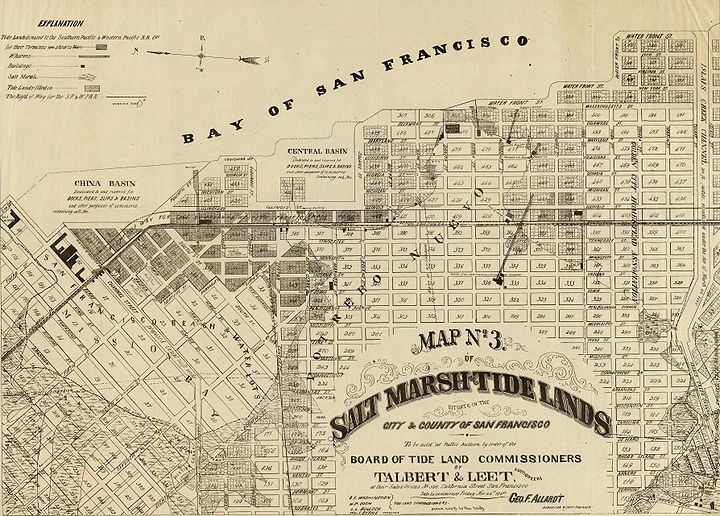 The three-man Tidelands Board appointed by Governor Haight was a powerful body, and it could be said to the commissioners’ credit that there was little criticism of their mode of operation, carried out as it was under the spotlight of every newspaper in San Francisco. They were to be involved in endless hearings of rival claims, sometimes stacked five deep on a single lot. What was to prove one of the more troublesome sections of the 1868 Tidelands Act stated, “Where any settler was on the first day of January, A.D. 1868 in bona fide actual possession of any one lot by himself or tenant, and any additional lot in which he shall have had substantial improvements at the time aforesaid . . . may purchase such lot. . .” prior to public auctions, in effect, at private hearings before the Tidelands Commission.97 As can well be imagined, Mission Bay squatters (who preferred to be called “settlers”) interpreted the phrase “substantial improvements” as being fine-tuned to their own interests, since many of them were living in houses on the banks of Mission Creek and on filled portions of Mission Bay. “Bona fide actual possession” was seen as an endorsement of the principle of “squatters’ rights,” an idea long cherished in the Potrero and Mission Bay. But having the major Mexican claim laid to rest by the Yankee courts gave all the more importance to the Tidelands Bill statement regarding “bona fide actual possession,” which was taken to mean “being there.” Rival claimants, some with titles going back to 1846, others to 1851 (with the sale of the Peter Smith water lots), moved into Mission Creek with pile drivers and a scow schooner armed with cannon (quickly dubbed the “Mission Creek Gunboat”); using pistols and knives they fought it out for possession. On November 19, 1868, the Alta noted, “It will be remembered by our readers that within the past year Mr. Charles P. Duane shot Mr. Ross on Merchant Street for an alleged interference in this matter of title to lands. Yesterday morning, about 3 o’clock, several men made their appearance upon the ground and demanded possession. During the skirmish a man named Baxter was seriously wounded.” And again, a week later, “The trouble on Mission Creek continues . . . the police have charge of the pile driver, mud-scow, or ‘gunboat,’ and they have instructions to allow no one on board. 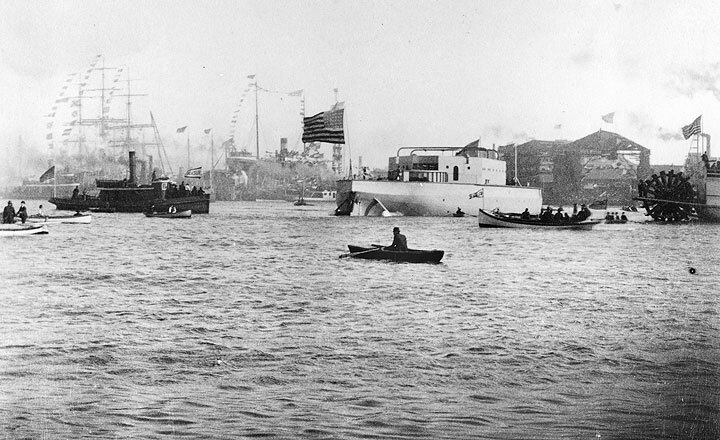 . . if parties owning the gunboat make any attempt to move it, and if those who ran the pile-driver on disputed territory attempted to use it, riotous proceedings would follow.” Some sixty men fought it out on Mission Bay’s Block 40. Several were seriously wounded; that no one was killed was probably a matter of luck rather than restraint. Block 40 lay between Berry and Channel streets and Seventh and Eighth streets. 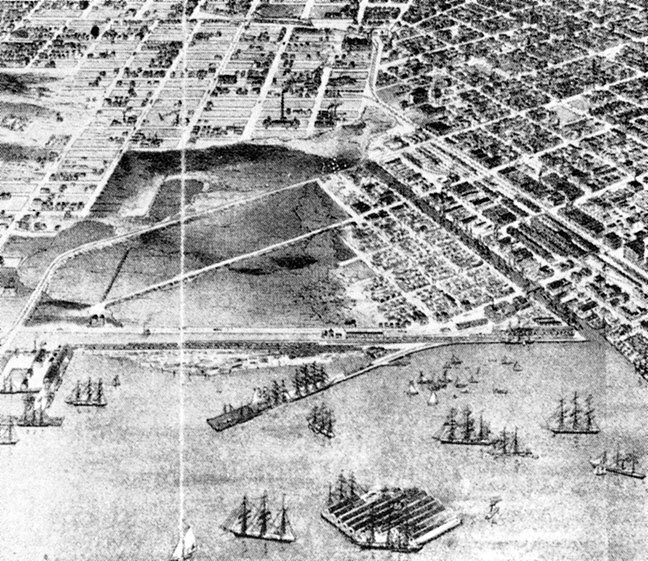 The block as shown in 1869 is partially in the salt marsh and partially under the waters of Mission Bay. Judge Field’s opinion had the further salutory effect of giving the settlers in the Potrero and Mission Bay what they had wanted, peace from further challenges of any real importance to their presence. 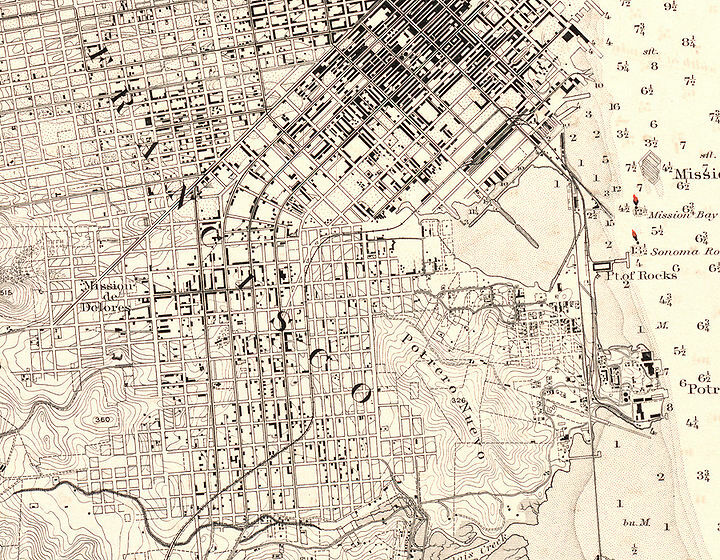 The Coast Survey Map of 1889 demonstrates how Long Bridge became the focal point for filling in Mission Bay. Jutting out the line of Fourth Street, carrying the railroad lines to the Southern Pacific freight sheds between Townsend and King streets, Long Bridge by then had a man-made delta at Third Street. 1889 U.S. Coastal Survey Map. 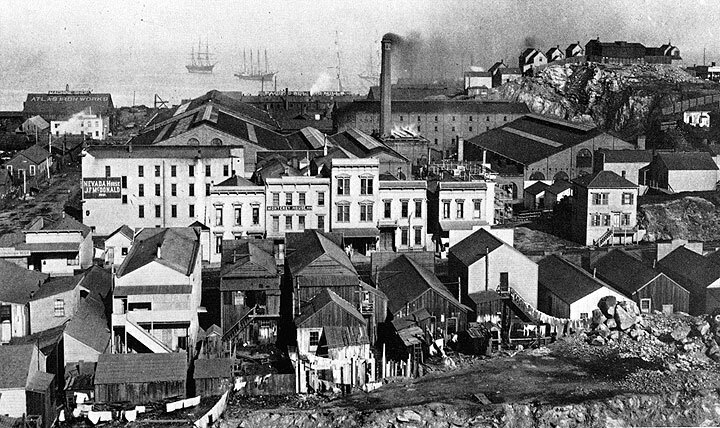 The “busiest part of the port” in the late 1880s and ’90s centered around Channel Street, with its finger piers reaching out to the scows and schooners bringing in bricks and cement, shingles and spars, lumber to be milled on Berry Street, grain for the South End Warehouse and hay for the horses that kept the city moving. Just north of the Channel Street entrance to the bay, steamers of the Pacific Mail Steamship Company arrived from New York and the Far East. At the foot of Second Street, Tichenor’s Ways has been sold to the Southern Pacific for $250,000 and is now the pier where the big railroad ferryboat, the Thoroughfare, brings locomotives and freight cars to run along the King Street rails to the Southern Pacific freight yards. The north side of Channel Street is very nearly filled in from Third to Sixth, where the map shows a slender finger of fill reaching south to connect with the line of Sixteenth Street, near the Point of Rocks. South of Berry, between Sixth and Seventh streets, an informal garbage dump persisted from 1878 until 1895, gradually extending until it covered twenty acres south of the channel. Garbage from the densely populated south-of-Market district came here at the rate of three hundred wagons a day. Before it was shoveled into the bay water, the “dump trust” sorted through everything for salvage. Largest of three small peaks on a submerged ridge, Mission Rock rose twenty-five feet above the bay waters and served as a navigational guide for ships. By 1884 it was more useful as an extended wharf to hold warehouses, as seen in the inset drawing made in 1900. H.B. Tichenor had his eye on Mission Rock when he sold out his marine railway to the railroad interests in 1870. He secured a tidelands’ grant to some submerged land around the rock and built a drydock, expanding less than a fourth of an acre into four acres. “With a general air of dejected doggedness, many were busily engaged with pitchfork, shovel or stick, sifting each load as it was dumped from the reeking, overflowing carts. Rags, old bottles, scraps of iron, old sacks, bricks, oyster shells, half-decayed fruit and vegetables—all were prized.103 Although the police sporadically raided “Dumpville,” burning the shacks that were put on “railroad lands,” the scavengers returned and business continued, since there were no neighbors to complain. The degree of pollution at Channel Street and in Mission Bay became so great that the water was sickening to smell and deadly to fall into. On the 1889 Coast Survey Map, all that remains from Mission Creek’s original estuary (as shown in 1852) is an inlet that hooks around toward Brannan and Eighth streets. By 1874, Mission Creek above Ninth and Brannan had been officially abandoned as a navigable stream.104 All of the land east of Mission Creek’s tidal remnant (south of Brannan and east to Fourth Street) had been progressively created by filling or spanning the waters of Mission Bay. The salt marsh at the southwestern edge of Mission Bay is more fenced than filled; only a few isolated farms appear on the 1889 chart. In contrast to the nearly empty edge of the old salt marsh is the industrial buildup at Potrero Point. Here the dream of the 1860s is realized by 1884. The Union Iron Works opened in 1882, directly adjoining the Pacific Rolling Mills, the point’s first major manufacturing industry, dating back to 1866. The Western Sugar Refinery dominated the southern waterfront of Potrero Point. Within a few years, the Atlas Iron Works would locate here. In spite of the depression, the big mills reverberated day and night, producing mining machinery, pumps, boilers, iron for the railroads, streetcar rails, bridges, marine hardware and big walking-beam engines, iron-clad monitors and cruisers for the Navy. Potrero production was the center of San Francisco’s industrial output from 1884 through the first World War. San Francisco paid higher wages to skilled craftsmen and industrial workers than could be earned in the East. But jobs were scarce and fought over. Poverty in the city was grinding and seemed never to end, bringing ugly outbreaks of anti-Chinese feeling as both races scrambled for any available work. The men who worked on Potrero Point lived there as well. Bill Carr, sheriff’s deputy in South San Francisco for forty-six years, came to Irish Hill as an infant in 1877 and grew up in the streets seen in the view below. The accompanying caption is his recollection. “It was mostly all hotels. . . The Green House, run by Mike Farrell. The White House run by Hans Rasmussen. Cash’s Hotel, run by Jimmy Cole. The San Quentin House run by Jim Gately. Gately took in the parolees from San Quentin and got them jobs in the rollin’ mills. . . There was Paddy Kearns’ Hotel, and outside the gashouse was Miek Boyle’s steam beer dump. . . The boys from one hotel would challenge the boys from another and fight all Saturday afternoon in a hayrope ring outside Gately’s Hotel. Then we’d all go in and knock off steam beers for a nickel a piece . . . You went up on Irish Hill when you got off work and you never left it until morning. Below it was Dutchman’s Flat, where the Dutchmen from the old country lived. . . Eight or nine hundred people use to live there. . . There were 98 wooden steps up the hill.”105 This view, taken in the 1890s, shows what was left of the serpentine hill, much of it having been blasted away and dumped in the bay. This is chapter eleven of "Vanished Waters: A History of San Francisco's Mission Bay" published by the Mission Creek Conservancy, and republished here with their permission. 94. Bancroft Scraps, Bulletin, reprinted from Sacramento Union, March, 1868. 95. Ibid. Bulletin March 3, 1868. 96. 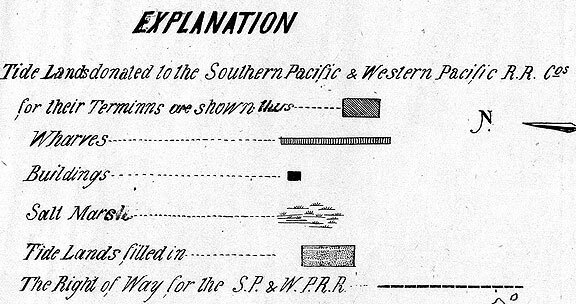 The “Eddy Redline” that appears on various maps of the tideland surveys refers to William Eddy, whose 1849-1850 survey was the first since Jasper O’Farrell’s 1847 efforts. In October of 1849 the town council ordered William Eddy to extend O’Farrell’s survey, as all the lots had been sold within the old city limits. The Eddy Redline delineates additional lands as far west of the old boundaries as Leavenworth and Eighth streets, near the present Civic Center. By January 1850 more than 3,000 of these lots had been sold. 97. California Statutes, March 30, 1868, p.720. 99. San Francisco Bulletin, January 23, 1877. 100. Alta California, August 31, 1878. 101. Alta California, August 19, 1878. 102. Alta California, January 7, 1872. The same article notes, “The total sales [tideland properties] amounted to $1.477,929.92. With expenses, the State of California netted $1,242,495.92. The University of California was given $200,000 from the sales and a perpetual annuity, according to an amendment of the original Tidelands Act. 103. San Francisco, Daily Evening Post, August 1878, and Chronicle, November 22, 1889. 104. Sharpsteen, “Vanished Waters of Southeastern San Francisco,” p. 115.